Team Rock: Brian May "How Adam Lambert joined the Queen family" "..never seen or heard anything like Adam.."
Team Rock: Brian May "How Adam Lambert joined the Queen family"
"Brian May's book 'Queen in 3-D' tells the band's story, from first album to the arrival of 'Madam Lambert'. Here, May reveals how the American Idol star became part of the Queen family"
Dr. Brian May: "Roger and I have seen literally thousands of singers in our lifetimes including some great ones auditioning for our We Will Rock You show (which, did I mention, ran for 12 solid years in The Dominion Theatre on the Tottenham Court Road in London?) but we’ve never seen or heard anything like Adam." Included in the article are VIDEOS: Go to the *LINK* at the bottom of this page to read the article and view the videos! 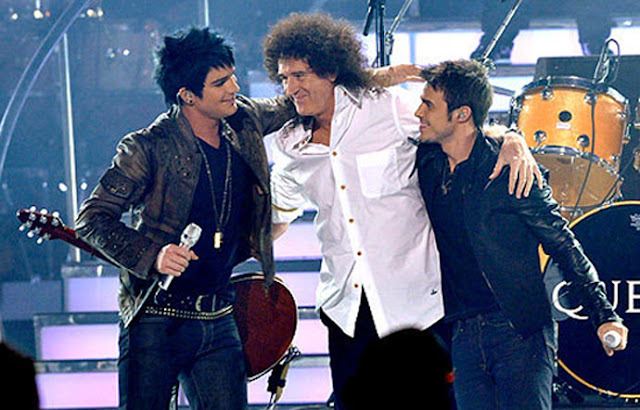 -Adam Lambert's American Idol audition QUEEN's "Bohemian Rhapsody"
When it all began: Adam Lambert, along with Kris Allen, and Dr. Brian May & Roger Taylor, sang with the legendary members of QUEEN on the American Idol Season 8 FINALE on May 20, 2009. The thing snowballed very quickly, and we started a long and very fruitful association with Adam in which he has become one of us, part of our family. He’s never attempted to be Freddie, and I think that’s what endears him to the fans, apart from the fact that he is an extraordinary singer with an extraordinary presence. Roger and I have seen literally thousands of singers in our lifetimes including some great ones auditioning for our We Will Rock You show (which, did I mention, ran for 12 solid years in The Dominion Theatre on the Tottenham Court Road in London?) but we’ve never seen or heard anything like Adam. I always think that Freddie, with a wicked smile, would say something like “I hate you, Madam Lambert,” because even Freddie would have been gobsmacked at his range and his ability to reinterpret these songs which the four of us originally created together. There are people out there who think it’s something quite unforgivable that we should be touring at all. They think we should pack up our gear and go into an old people’s home. But it’s been very obvious that not just the old folks, but at least two new generations around the world have absolutely latched on to Queen music, and love it, and have woven it into their lives; and they love seeing us play it live with this ‘boy’. Wonderful article by Brian!.....He says that Adam has the BEST voice...they've ever heard...among other great compliments for Adam. And here's a lovely "side" article I found as an "offshoot" of this one......" Why Adam Lambert is the Perfect Man for Queen"....gotta love it, too! BTW...Dee R Gee... and all the other aficianos of the "Golden Fringe"...a splendid medley of Adam wearing the fringe (Chicago 2014)is included with the above article I just added in the above comments...plus the iconic "Love Kills" from the iHeart Theatre video. Enjoy! Thanks for that second link, Nanbert! It was a very good article about why Adam deserves to perform with Queen. I completely agree with the article. Trouble is, the reaction of those Queen purists is pure, visceral emotion. Freddie is their guy and no one else has the "right" to take his place. Paul Rodgers kind of gets a pass because he is so unlike Freddie. But Adam possesses that same flamboyant magic, so he is perceived as a threat. Nice to see the Chicago "Killer Queen." I was at that show in 2014. Blew me away. I must say, though, that this Chicago show was the very first stop on the first tour. I loved every moment of it, but since then, after viewing TONS of vids from numerous show, I have to say that the show really evolved into something much bigger and better after Chicago. Chicago was just the beginning of something really blossomed. Dee R Gee...WOW...you were at the first One! Even though I agree the show has evolved to be bigger and better....at that time it was the greatest thing I'd ever seen. I notice, though, that Adam did not do his glorious "fringe twirl" we both love at that Chicago concert. But they've all become much more seasoned now....and probably much less nervous, since they've become more accustomed to performing live together, and have that trust and chemistry that takes time to develop.....and how can they not enjoy performing at such an amazing level...with such amazing talent....and such appreciative audiences! I bet, since you were at that first Chicago concert, you remember the moment that is indelibly imprinted in my mind...when Brian took Adam's crown from his hands....and PLACED IT ON HIS HEAD....symbolically crowning him....a moment of GREAT meaning to me! Then Adam reached up, glanced at the audience over his shoulder, and did a cheeky "top hat" tip of the crown...with a big grin of triumph on his face. And nothing has ever been the same since! Oh my! Actually, Brian gave Adam the crown and Adam put it on, but then he rather shyly took it off. Brian had to tell him to put it back on! Adam must have felt overwhelmed by the honor. Also, at this first show, Adam didn't actually drink from the bottle at the end of Killer Queen. It was a sealed bottle and he just faked drinking from it. It took a few shows before he had an open bottle filled with water. Then the spitting began! The show has evolved into something SO epic! They just kept upping their game each time. We are so lucky to be witnessing it. Crown during WWRY and WRTC, and to the end. Then he took it off for "God Bless the Queen" and held it against his heart... then he and Brian were facing each other....Brian handed his guitar to Adam, took the crown from him and placed it on Adam's head. Then Adam reached up and tipped it a bit forward and "posed" slightly over his shoulder to the audience. Is it possible I got this mixed up with another show? I certainly remember that Adam didn't really drink from the champagne bottle at first. But when he did, and started showering the audience, I had the definite sense that Brian was never too sure that Adam wouldn't spritz him one day....and always scurried away rather quickly so as not to be too tempting! haha. And I remember he was beautiful in those golden fringed sleeves! Dee R Gee... here it is....just like I remembered it....gives me goosebumps all over again! Maybe you remember it differently because you didn't have as good an angle as the photographer, so you didn't see it all. Also all the confetti falling and people flailing might have obscured your vision. ENJOY!!! What a beautiful, joyful moment for them!!!! Can yhou imagine their relief at their reception by their FIRST audience on that tour? Hi guys!! Sorry I had to cut & run today during the stream @Liverpool but once again RL stepped in .. this time it was hubby's turn to visit the hospital ... seems he has an inguinal hernia & it decided to rear it's ugly today when he got back from shopping!! I'm pleased to report that all's well for awhile but surgery is in his future for that too!! Thank you both for that wonderful stroll via video's & memories down Memory Lane from the Chicago concert!! I love sitting here & reading all about your experiences at these concerts (I do live vicariously through the so I really get a big kick out of them!! Some of these videos are so realistic I take a guilty pleasure in pretending I was there too!! Shame on me ... hahaha!! That look on Brian face . . he knew . . "Gift from God"
Love Bri's comment that many want him and Roger to pack up and go to the old folks home! Lol now that would be one very lively old folks home! Lambert Outlaw....I keep thinking about you watching all the videos of QAL and lamenting the fact that you can't see them in person.....and assuring you that watching the videos is a different experience...but just as good, if not better, in some ways. IMO. Yes, there's the excitement of the audience and the ambiance of a live quality spectacle...but, there's always some people who sing so loud along with the music that you can't hear the performers clearly. For example, WWTLF seems to bring out all the Lambert-wanna-bes at the top of their lungs...right in your ear...OFF KEY! Of course, there's lots of places you SHOULD sing, and that's fun. too. My QAL concert in July found me next to a young woman who was either insane or on something really heavy duty. She stood, and wildly danced the entire time, whether the music was playing or not...endangering me constantly with her flying arms and elbows. The people behind her kept begging her to sit down (when everyone else was) so they could see. Of course, the people in the arena were standing up and sitting down in unison, so no one was blocked...except those behind her. I finally had to take her to task and insist that she sit down and stop girating so that her neighbors could see and I could stop ducking. That involved losing a whole song sequence while she kept trying to talk back....but neither of us could hear the other because the music was so loud....very frustrating! Then, just as she seemed to understand that she should sit down, everyone in front of us stood up again. But she just sat there, sullenly staring straight ahead, unable to see anything. So I had to take her arm and physically drag her up so she could see! What a pain in the you-know-what she was! But at least, after all that, she settled down, and no longer became a distraction to everyone. This probably doesn't make you feel better about missing out on the tour, but let me further elaborate on the virtues of watching the videos. In many cases, you will never see the details in the real performances that you can see in good videos...especially close-ups...and, you can re-play special ones over and over if you wish...I do. Also, I find a good QAL video a more intimate experience...somehow remembering a live performance afterwards is difficult....too many conflicting experiences. And playing videos of a performance I've JUST seen are always "new" and enlightening about something I've missed or just didn't register at the moment. Last, but not least, the huge "Queen sound" is earth (and eardrum) shattering!..sometimes actually physically painful. I had to stuff a little bit of kleenex in my ears to slighty "buffer" the decibels! So, yes, there's nothing that can compare to a live QAL concert experience... BUT, there's also nothing that can compare to quietly immersing yourself in quality videos of those same performances...sometimes from different vantage points...sometimes re-played over and over...NO distractions...just you and QAL! I guarantee you will KNOW that performance better than if you'd seen it live! So.. don't be disappointed, and don't fret, Tess....QAL is "good to the last drop" no matter how you experience them. Thank goodness for the internet and Youtube! Apparently, I was mistaken about which show it was. I distinctly remember Brian giving the crown to Adam, who put it on his own head and then took it off. Brian motioned for him to put it back on. I kept thinking it was the Chicago show, but apparently I was wrong. Does anyone else remember what I remember? It must have been the FIRST time Adam was given the crown. It would make no sense otherwise. Help, please! I'm know I'm not hallucinating or miss-remembering the event. I'm just missing which show it was. Dee R Gee....maybe it was a bit AFTER that video was shot that something like that happened...which wasn't captured on the video. Dee R Gee...just revisited that video. It continued until they all left the stage, so that couldn't have happened then. Great video to revisit though!